Last night I saw a fellow zipping along and passing other bikes. I stopped at the local Tim Horton's and he pulled in. Turned out he was a migrant worker. A local charity accepts "junk" bikes and refurbishes them for the workers so they can get off the farm and to the stores. Usually I see old 10 speeds with cheap modern flat bars, mountain bikes, even single speed beach cruisers. This fellow got an Olympian. The bell isn't original and maybe the seat and rack aren't correct but pretty much everything else was. It had nice none standard fluted seat post and a well engraved set of bars. Compared to his compatriots I think he won the lottery. He seemed to be quite happy with it. I couldn't think of a more derogatory yet still socially acceptable label for someone who moves to this country to make a new way in life than "migrant worker." Bravo. The fact that he is an immigrant has absolutely no bearing on the bicycle he picked up at a co-op. Nor should it have any influence on anyone's opinion about how "lucky" he got with the find. Last edited by Kilroy1988; 06-17-18 at 09:32 AM. The official government term is Seasonal Agricultural Worker. Canada has a program co-sponsored with Mexico and Caribbean countries, that permits workers from those countries to work on Canadian farms for up to eight months, filling labour shortages during peak seasons. I work quality control in a fruit packing facility with three hundred hard working Mexicans. If I referred to any of them as a "migrant worker" I don't think they would appreciate it. The term is a literal reference to someone's immigration status. I live in a community that is 90% Hispanic in the San Joaquin Valley, where the highest influx of seasonal agricultural workers in the United States occurs. I refer to them as people. Anyway, this is clearly not an appropriate topic for this forum. I honestly am bothered that someone's immigration status is somehow connected to their good fortune in finding an old bicycle. It's totally irrelevant and I do not think it should have been mentioned, especially in such qualifying terms. Last edited by Kilroy1988; 06-17-18 at 10:36 AM. You do realize that migrant and immigrant are two different words? I have a bad feeling that this post will sink into something political which was not it's intent. I would have preferred you to have emailed me personally if you felt strongly about this as you comments were a bit judgmental. Sorry you saw my use of the term "migrant worker" as a derogatory term. I recognize that you can see the term as an issue or see it as a negative. I don't. I respect anyone who is willing to work. As T-Mar points out these men and women (in this case) come to Canada, not the USA on a work visa and will be returning home. They work in local farms and save their earnings for there families back home. I make the donations to help this program and to help these people who could not otherwise have a bike. I have fixed bikes to send to Cuba for working poor there. I stopped and talked to this man about biking in general and his bike specifically. I told him it was a wonderful bike and he concurred. He felt the mountain bikes were not as nice. We were just two men talking cycling on a hot evening in Southern Ontario. By the way we both shared a prejudice, neither of us desired a carbon bike. I posted earlier about a man who is not poor and who got a Benotto for $30 Canadian. I think he got a really good deal for $30 and I shook his hand too. In this matter I was simply commenting that, based on the general condition of the bikes I see donated around here this man had really lucked out and surprise, I was happy for him. Yes. And thousands of the local people who are migrants here are not allowed to attempt immigration due to the restrictive costs of doing so. Many of the people I know who return to Mexico each year would happily move to the US if they were given the opportunity. Lord, this is such a sticky and inappropriate topic. I shall not continue. The basic point is that someone being a migrant, immigrant, or anything else should have no bearing whatsoever on the bicycle they own. @wbg I imagine the way you perceive the term in Southern Canada is far different than the way it is perceived here in central California. My apologies for not sending you a PM. I frequently witness hard-working migrants and immigrants being singled out as lower-class individuals due to their status here, passed over for job opportunities, not allowed to leave stores without displaying their receipts as I walk by casually, pulled over by police because their rugged automobiles stand out, etc, etc. It irks me greatly to see people qualified in such a way for good or ill.
LOL. Maybe some of you should check out the P+R forum. Some pretty good discussions going on in there. or . Depending on your views. Again, my apologies for not addressing the issue in private first. I just witness the reality of how migrants and immigrants are perceived and treated where I live on an almost daily basis, and it frustrates me to no end. I should have taken the time to consider the context of WBG's location and his own perception of the term. I'm sorry. Instead of criticizing the OPs choice of phrasing, I'll try to change the subject by slagging the bike. I had one of these for a short while, exact same year and color but in much nicer condition. It wasn't great. Kinda heavy and dead feeling. Pretty slow. Just another low-mid level bike with a nice paint job. Last edited by Lascauxcaveman; 06-19-18 at 12:12 AM. All good at my end. Lets just move on. Lascauxcaveman - you might be right about the ride, owner offered to let me ride it but I am too big. Owner said the seat kept slipping and I didn't have any allen keys with me but he was flying on that thing when he rode it. At the time I photo'd it because I like an old Raleigh and I liked the stampings on it (other pictures didn't turn out). Weird bars with a stylized "GB" on each side wrapped in laurels (don't have my own photo so got this online). Note photo is close but not exact as the ones I saw were aluminum and these are steel and there was a lot more engraving on the ones he had last night. Weird bars with a stylized "GB" on each side wrapped in laurels (don't have my own photo so got this online). Calling a moderator!! Sorry for duplicate - can you remove one????? Trump supporters show their true colors there. Migrant worker and lucky seem to be a contradiction in terms. I don't see a problem with stating the the Raleigh owner was a migrant worker.... provided he states everyone's citizenship and employment status when pertaining to "Bicycle" acquisition . Here I'll help, I'm a small business owner and by the grace of God, a 5th generation Texan. If I am among a group of even very poor people, and am given a relatively good bike, I will feel lucky and that is what counts. Poor people and rich people can both have good luck even though on perhaps a completely different scale. I was lucky enough today to find a dime in the road while waiting on my bike for a light to change. And I was lucky to find a convenient place to refill my water bottle when it was needed. We stand divided by so many things, among them whether we accept the corporate media's language terms that serve to define and thus direct both sides of any argument, and for that matter whether or not we choose to believe their news narratives. I found myself wondering if the speedy bike recipient was given (and was wearing) a helmet. I once came across a sad scene at an L.A. intersection in the middle of the night where a very young Mexican man likely returning home from a restaurant job had been struck by a car, struck his head and was lying in the road semi-conscious, no helmet or lights and low-visibility bike and clothing. I don't know if he survived and likely his family back home was relying on him. The whole immigration circus and our perceptions of it are manipulated by the hidden-hand forces of the greater corporacracy/crown/empire hierarchy and their media lackeys. I caution people to (as Chas might say) not believe what they think. Just to add a little to the dog pile, Way back in the summer of '99, I tried blueberry picking. I lasted about a week working with seasoned migrant workers. They where all white folks, but one of the highest praise i heard was if you could do something Mexican Style. A round the same time I was working for a contractor who highest standard of efficiency was Cuban Style. 10 years later I picked up a landscaping gig mainly as a licensed driver, and people assumed i was the bosses son, as it was so incongruous to see a white guy trying to keep up with a motivated crew of Ecuadorians. Everyones got a perspective, but I think it's getting a little weird when "Works for a liveing" implies brown skin. Last edited by bark_eater; 06-20-18 at 05:18 AM. 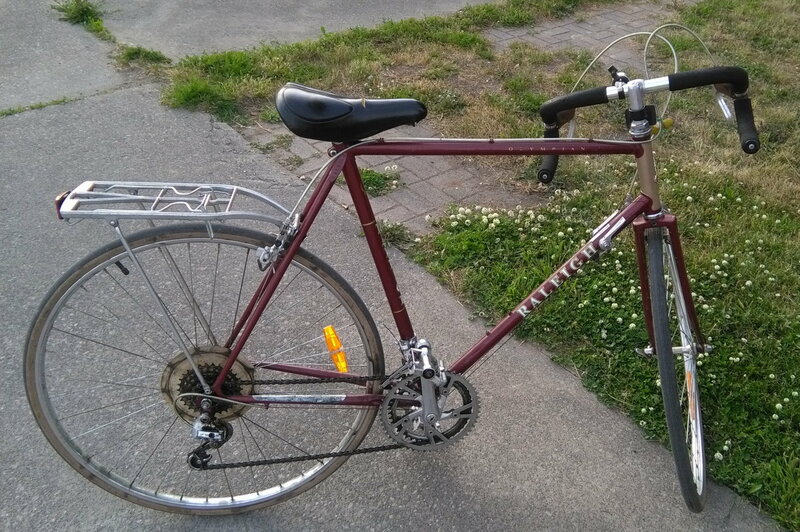 Raleigh Olympian, I've had one, and its in my "nothing special but good basic transportation" category. This entire thread turned out political. Sorry but it’s closed.